There are, of course, many theories about why the people of Hunzaland live so long. Patrick Flanagan, the founder of Micro Cluster technology believes that the water is the secret along with hundreds of other people who have been using his products. The King of Hunza Land was asked why their people live so long and he said "It's the Water." The lifestyle and diet likely play an important role but their water is very different then water in other parts of the world. We see a lot of hands going up. Fine. But first, you have to answer a few more questions before setting out for a place called Hunza, a tiny country hidden in the mountain passes of northwest Pakistan. Are you willing to live 20,000 feet up in the mountains, almost completely out of touch with the rest of the world? Are you ready to go outside in every kind of weather to tend your small mountainside garden, while keeping you ears open for an impending avalanche? Are you prepared to give up not only every luxury of civilization, but even reading and writing? But don't give up! Not yet, because there is still one more question to be answered. That is: are you prepared to eat the kind of food the Hunzas eat? If you are, then you can rightfully expect to give yourself at least some measure of the super health and resistance to degenerative disease which the Hunzakuts have enjoyed for 2,000 years. Maybe you're wondering: are the Hunzas really all that healthy? That was the question on the mind of cardiologists Dr. Paul D. White and Dr. Edward G. Toomey, who made the difficult trip up the mountain paths to Hunza, toting along with them a portable, battery-operated electrocardiograph. In the American Heart Journal for December, 1964, the doctors say they used the equipment to study 25 Hunza men, who were, "on fairly good evidence, between 90 and 110 years old." Blood pressure and cholesterol levels were also tested. They reported that not one of these men showed a single sign of coronary heart disease, high blood pressure or high cholesterol. Beyond more freedom from disease, many observers have been startled by the positive side of Hunza health. Dr. Banik, for example, relates that "many Hunza people are so strong that in the winter they exercise by breaking holes in the ice-covered streams and take a swim down under the ice." Other intrepid visitors who have been there report their amazement at seeing men 80,90,and 100 years old repairing the always-crumbling rocky roads, and lifting large stones and boulders to repair the retaining walls around their terrace gardens. The oldsters think nothing of playing a competitive game of volleyball in the hot sun against men 50 years their junior, and even take part in wild games of polo that are so violent they would make an ice hockey fan shudder. That amounts to just half the protein , one-third the fat, but about the same amount of carbohydrates that we Americans eat. Of course, the carbohydrate that the Hunzakuts eat is undefined or complex carbohydrate found in fruits, vegetables and grains, while we Americans largely eat our carbohydrates in the form of nutrition less white sugar and refined flour. Needless to say, the Hunzakuts eat no processed food. Everything is as fresh as it can possibly be, and in its original unsalted state. The only "processing" consists of drying some fresh fruits in the the sun, and making butter and cheese out of milk. No chemicals or artificial fertilizers are used in their gardens. In fact, it is against the law of Hunza to spray gardens with pesticides. Renee Taylor, in her book, Hunza Health Secrets( Prentice-Hall 1964) says that the Mir, or ruler of Hunza, was recently instructed by Pakistani authorities to spray the orchards of Hunza with pesticide, to protect them from an expected invasion of insects. But the Hunzas would have none of it. They refused to use the toxic pesticide, and instead sprayed their trees with a mixture of water and ashes, which adequately protected the trees without poisoning the fruit and the entire environment. In a word, the Hunzas eat as they live -organically. Of all their organically-grown food, perhaps their favorite, and one of their dietary mainstays, is the apricot. Apricot orchards are seen everywhere in Hunza, and a family's economic stability is measured by the number of trees they have under cultivation. They eat their apricots fresh in season, and dry a great deal more in the sun for eating throughout the long cold winter. They puree the dried apricots and mix them with snow to make ice cream. Like their apricot jam, this ice cream needs no sugar because the apricots are so sweet naturally. But that is only the beginning. The Hunzas cut the pits from the fruits, crack them, and remove the almond-like nuts. The women hand grind these kernels with stone mortars, then squeeze the meal between a hand stone and a flat rock to express the oil. The oil is used in cooking, for fuel,as a salad dressing on fresh garden greens, and even as a facial lotion ( Renee Taylor says Hunza women have beautiful complexions). Do these kernels have important protective powers which in some way play an important role in the extraordinary health and longevity of the Hunza people? The evidence suggest they very well might. Cancer and arthritis are both very rare among the Taos (New Mexico) Pueblo Indians. Their traditional beverages is made from the group kernels of cherries, peaches and apricots. Robert G. Houston told PREVENTION that he enjoyed this beverage when he was in New Mexico gathering material for a book dealing with blender shakes based on an Indian recipe. Into a glass of milk or juice, he mixed a tablespoon of honey with freshly ground apricot kernels (1/4 of an ounce or two dozen kernels) which had been roasted for 10 minutes at 300. It is vitally impotent to roast the kernels first. Houston points out, "in order to insure safety when you are using the pits in such quantities." roasting destroys enzymes which could upset your stomach if you eat too many at on time. In any event the drink was so delicious that Houston kept having it daily. On the third day of drinking this concoction, Houston says that a funny thing happened. Two little benign skin growths on his arm , which formerly were pink had turned brown. The next day, he noticed that the growths were black and shriveled. On the seventh morning, the smaller more recent growths had vanished completely and the larger one. about the size of a grain of rice, had simply fallen off. Houston says that two of his friends have since tried the apricot shakes and report similar elimination of benign skin growths in one or two weeks. What is there in apricot pits that could produce this remarkable effect? 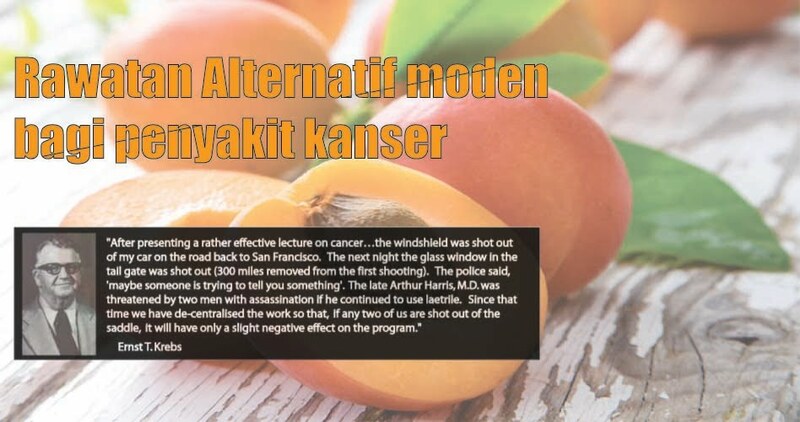 some foods, especially the kernels of certain fruits and grains, contain elements known as the nitrilosides (also known as amygdalin or vitamin B 17) says Dr. Ernst T. Krebs, Jr., biochemist and co-discoverer of Laetrile, a controversial cancer treatment ( Laetrile is the proprietary name for one nitriloside) Nitrilosides, says Dr. Krebs, are non-toxic water-soluble, accessory food factors found in abundance in the seeds of almost all fruits. They are also found in over 100 other plants. Wherever primitive people have been found to have exceptional health, with marked absence of malignant or degenerative disease, their diet has been shown to be high in the naturally occurring nitrilosides, Dr. Krebs maintains. "These nitrilosides just might be to cancer what vitamin C is to scurvy, what niacin is to pellagra, what vitamin B12 and folic acid are to pernicious anemia," says Dr. Krebs (Cancer News Journal, May/August, 1970). The bread which accompanies each meal enjoyed by the Hunzas, and sometimes forms the mainstay of the meal, is called "chappati" - and is quite different from any bread that we are used to. The grain is kept intact as long as possible, and is ground at the very last moment, the housewife grinds only as much as she needs for the next meal, and kneads again and again with water- no yeast! She then beats it into very thin, flat pancakes similar to the tortillas of the Mexican Indians, Chappatis can be made form wheat, barley, buckwheat of millet, So although chappati is something new to us, the ingredients are all familiar and easily available. Sometimes the flours are mixed together and baked in several shapes, small or large, depending on the occasion. While bread baking at home in our country is practically a lost art because of the time involved, a surprising feature about chappatis is the incredibly short "baking time", if you can call it baking at all. The dough is simply placed on the grill for hardly more than a moment and it is finished. "Just long enough to grow warm and no longer taste raw". Dr. Ralph Bircher noted in his book on Hunzas published by Huber in Bernie, Switzerland. "No more effective method of preserving the health value of the grain exists and the taste is excellent even without butter or jam, " Dr. Bircher notes.